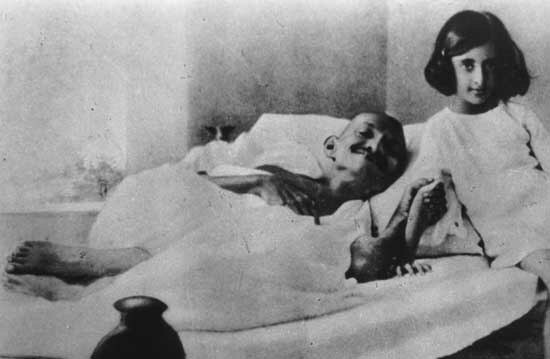 This is the famous speech The Eve of The Last Fast – “Do or Die” written by Mahatma Gandhi on non-violence, read out by his associate in his presence (as Gandhi was observing silence day) on Jan 12,1948 after the prayer meeting at Birla house, New Delhi. 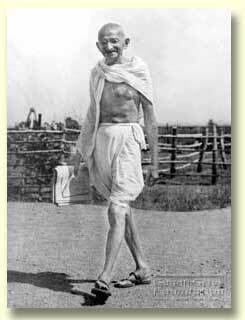 Gandhi came back from Calcutta in Sep,1947 and was on his way to Punjab but the situation in Delhi made him to stay back. During his stay in Birla House he met thousands of refugees and other visitors. 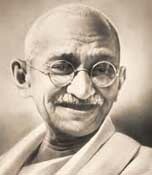 His daily prayer meetings helped in spreading the message of peace. When Delhi turned violent, he announced his 15th (and last) fast for establishing communal amity in the city. The fast began on 13th Jan,1948 and continued till 18th Jan,1948. He gave up the fast only after getting list of assurances to maintain communal peace from the community leaders under the mediation of Dr. Rajendra Prasad. One fasts for health’s sake under laws governing health, fasts as a penance for a wrong done and felt as such. In these fasts, the fasting one need not believe in Ahimsa. 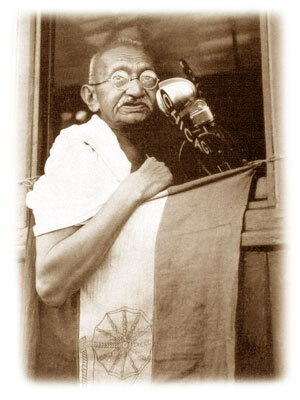 here is, however, a fast which a votary of non-violence sometimes feels impelled to undertake by way of protest against some wrong done by society, and this he does when as a votary of Ahimsa has no other remedy left. Such an occasion has come my way. When on September 9th, I returned to Delhi from Calcutta, it was to proceed to the West Punjab. But that was not to be. Gay Delhi looked a city of the dead. As I alighted from the train I observed gloom on every face I saw. Even the Sardar, whom humour and the joy that humour gives never desert, was no exception this time. The cause of it I did not know. He was on the platform to receive me. He lost no time in giving me the sad news of the disturbances that had taken place in the Metropolis of the Union. At once I saw that I had to be in Delhi and ‘do or die’. There is a apparent calm brought about by prompt military and police action. But there is storm within the breast. It may burst forth any day. This I count as no fulfillment of the vow to ‘do’ which alone can keep me from death, the incomparable friend. I yearn for heart friendship between the Hindus, the Sikhs and the Muslims. It subsisted between them the other day. Today it is non-existent. It is a state that no Indian patriot worthy of the name can contemplate with equanimity. Though the Voice within has been beckoning for a long time, I have been shutting my ears to it, lest it may be the voice of Satan otherwise called my weakness. I never like to feel resourceless, a Satyagrahi never should. Fasting is his last resort in the place of the sword-his or other’s. I ask you all to bless the effort and to pray for me and with me. The fast begins from the first meal tomorrow. The period is indefinite and I may drink water with or without salts and sour limes. It will end when and if I am satisfied that there is a reunion of hearts of all the communities brought about without any outside pressure, but from an awakened sense of duty. The reward will be the regaining of India’s dwindling prestige and her fast fading sovereignty over the heart of Asia and there through the world. I flatter myself with belief that the loss of the hope of the aching, storm-tossed and hungry world. Let no friend, or foe if there be one, be angry with me. There are friends who do not believe in the method of the fast for the reclamation of the human mind. They will bear with me and extent to me the same liberty of action that they claim for themselves. With God as my supreme, and sole counsellor, I felt that I must take the decision without any other adviser. If I made a mistake and discover it, I shall have no hesitation in proclaiming it from the housetop and retracing my faulty step. There is clear indication, as I claim there is, of the Inner Voice, it will not be gainsaid. I plead for all absence of argument and inevitable endorsement of the step. If the whole of India responds or at least Delhi does, the fast might be soon ended. But whether it ends soon or late or never, let there be no softness in dealing with what may be termed as a crisis. Critics have regarded some of my previous fasts as coercive and held that on merits the verdict would have gone against my stand but for the pressure exercised by the fasts. What value can an adverse verdict have when the purpose is demonstrably sound? A pure fast, like duty, is its own reward. I do not embark upon it for the sake of the result it may bring. I do so because I must. Hence, I urge everybody dispassionately to examine the purpose and let me die, if I must, in peace which I hope is ensured. Death for me would be a glorious deliverance rather than that I should be a helpless witness of the destruction of India, Hinduism, Sikhism and Islam. That destruction is certain if Pakistan ensures no equality of status and security of life and property for all professing the various faiths of the world, and if India copies her. Only then Islam dies in the two India’s, not in the world. But Hinduism and Sikhism have no world outside India. Those who differ from me will be honoured by me for their resistance however implacable. Let my fast quicken conscience, not deaden it. Just contemplate the rot that has set in beloved India and you will rejoice to think that there is a humble son of hers who is strong enough and possibly pure enough to take the happy step. If he is neither, he is a burden on earth. The sooner he disappears and clears the Indian atmosphere of the burden the better for him and all concerned.